In our opinion Warhammer 40,000 and the first person shooter genre go together like Space Marines and, well, space! They are made for each other and this is one of the many reasons why we are excited about Space Hulk: Deathwing. Space hulk is a tactical FPS based on the popular tabletop game of the same name. You are a ‘Librarian’, who is teamed with a squad of the ‘Deathwing’ who are the elite first company of the Dark Angels Space Marine chapter. You are tasked with exploring Space Hulks which are derelict space stations and space ships mashed together with asteroids and all sorts of space debris. Whilst exploring these leviathans you will be fighting against the Genestealers, an alien race comprising of genetically engineered lifeforms. 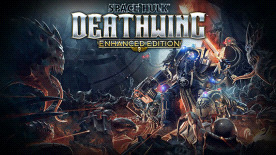 We cannot wait to don the iconic Warhammer 40k Space Marine armour and see what Space Hulk: Deathwing has to offer.